Tired of Being a Landlord? Here’s the Problem. Being a landlord of an investment property can cause a tremendous headache. There mean constantly finding home maintenance, handymen, and hiring unreliable property management companies. There is also means dealing with bad tenants that can make you sick. At times, leasing out your rental home isn’t a good fit for everyone. So what do you do when you are tired of being a landlord in Chicago? There are several reasons why landlords sell rental property in Chicago IL. One of the biggest reasons includes low amount of capital to maintain your property. Many landlords expect to pay for minor repairs, paint, and other typical home maintenance. However, hidden expenses can cause your perceived profit margin to shrink. Replacing bad appliances or repairing a leaky roof can create a negative cash flow. This discourages most landlords. Many rental property owners look to hire third parties to manage their estates. They do this for various reasons, from not wanting to want deal with tenants to employing contractors to fix basic and major repairs. But hiring property management companies can be a more costly and time consuming solution to conflicts. Property management companies are an added expense, further subtracting from a landlord’s potential return on investment. A landlord can lose out on a huge amount of profit when hiring a property management company. The expenses don’t end with monthly management cash spent. Property management groups are also known to overcharge for small repairs. A leaky faucet can turn into a multiple-hundred-dollar call to a plumber. A loose floorboard can cost a landlord thousands when the management company hires a contractor. Without a sharp eye, property management companies can take advantage of your hands-off approach to being a lanlord. Dealing with tenants is one of a landlord’s hardest duties. When hiring property management companies you trust they’ll deal with high-maintenance renters. Yet, property management often don’t know what they’re doing when tenants tear up your house. And the Chicago landlord tenant ordinance can be a nightmare to handle. Sometimes taking on bad tenants cannot be avoided. To prevent monetary loss from vacancy, property management companies will fill a rental with any tenant that applies. They’ll often forget about doing an extensive background check. This is a very costly mistake. Bad tenants can default on Chicago lease agreements or leave with your appliances or furniture. They can even do damage to your property that cannot be repaired! The damage given can transform your newly updated home into an unwanted fixer-upper. You’ll be tired of being a landlord faster than you might think because the bad tenant stories can get crazy. Property management companies can be an expensive, unreliable option to maintaining your rental property. Selling your home might be your best thing to do when you’re tired of being a landlord. Most sellers consider using a real estate agent when selling their property. But, many realtors have a hard time selling a house with tenants. It’s true. Some tenants can be uncooperative and cunning mean during the selling process. Others refuse to pay the last month’s rent before the sell and, some call code enforcement so code violations are placed on the property by the city-costing even more time and money. Before hiring an agent to assist in selling a house with tenants, make sure the have experience with this situation. Decide whether they’re worth the head pain and cash it costs to sell a tenant-occupied property. If selling your property is the best option when you’re tired of being a landlord, how do you sell your house with tenants quickly? In many circumstances, selling to a house buying company is the best option.. Use the offers made by a house buying company. It’ll often give you the easiest and least stressful answer to many property problems. You don’t have to stress over the Chicago ordinances of how to evict tenants living in your rental property. You can to sell to a house buying company without evicting tenants. Get rid of bad tenants and costly property management fees in a quick, easy sale without using an agent. House buyers buy homes as-is, even those in bad condition due to disrespectful tenants. Another option is to sell your home to a cash house buying company. You won’t have to worry about any repairs. There are no fees and you save thousands on agent commission costs. You can also receive a no-obligation cash offer in just 24 hours. We Buy Houses Fast Chicago gives you a cash offer within one day and you can close whenever works best for you. You can have your Chicago house sold in a week! 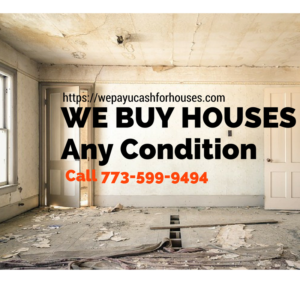 If you need to sell your Chicago area house fast and would like to get a no-obligation cash offer, call us now at 773-599-9494. Whether you decide to sell your house to us or not, we would like to help answer questions you might have about the process. Good for you, we buy houses in Chicago. Our home sellers comment all the time about our soft approach. You won’t get a hard sell with us. If you are not completely satisfied with the offer we make to buy your house, you don’t have to accept it. No charge. No fees. If you’re a tired of bad tenants in Chicago, we’d love to talk to you today about the house and your situation. We’re here to help even if you decide not to sell your house.